Home » India News , Politics , Uttarakhand News » Uttarakhand: Race begins between BJP, Congress to form Govt. 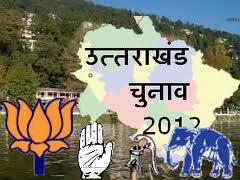 Uttarakhand: Race begins between BJP, Congress to form Govt. Race begins in Uttrakand to rope in potential allies to form a government in Uttarakhand with their leaders speaking to BSP, independent and Uttarakhand Kranti Dal MLAs over phone. While Congress has emerged as the single largest party with 32 seats in the 70-member House, BJP finished one less seat in a cliff-hanger contest for the state assembly polls. BSP has won three seats, Uttarkhand Kranti Dal one and independents three. Senior Congress leader Vijay Bahuguna claimed to reporters in Dehradun that some independents have promised support to Congress. He said the party leaders have spoken to the independent MLAs and some BSP legislators over phone. Asked if the party has secured the support of independents, Baghuguna said "yes, we have. We have because a majority of them are from Congress background. They have already pledged their support and we are in touch with others also." To a question on the total number of MLAs who would back Congress' bid to form government he said "I think it will touch about 38". Bahuguna said a meeting of CLP has been convened today which will adopt a resolution authorizing party President Sonia Gandhi to nominate a CM and "she will do that in a day or two" A delegation of state Congress party leaders held talks with Sonia Gandhi in New Delhi on the issue of formation of new government.